In the eighth century, the popes represented a rich and sometimes contradictory cultural repertoire of Romanness. This complex consisted of different layers of cultural memories: ancient Rome, the Christian Empire, the Roman (‘Byzantine’) Empire now based in the East, and the Roman ‘res publica’ that the popes attempted to carve out for themselves in Italy. Papal Rome was keen to cultivate all of these layers and the resources for identification that they offered, harnessing them to their spiritual discourse and their political needs. For the eighth-century Carolingians, this huge symbolic capital offered opportunities to translate their political power into legitimate Christian authority and rulership, first as kings (751/54) and then as emperors (from 800). 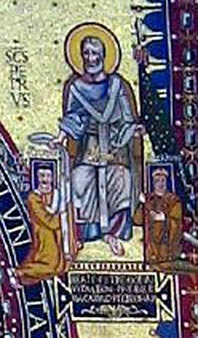 The success of the model of Christian rulership advocated by the popes becomes obvious in historiography: from contemporary authors up to historians of our day, the papal-Frankish version of the story has been more or less canonized knowledge; its enemies (Lombards, Bavarians, Avars) were marginalized. The political side of the story has often been told. This project will concentrate more on the cultural resources assembled and developed in Rome to establish models of Christian rulership – not only in Francia – and the privileged role of the popes within them. Throughout the eighth century, the popes increasingly tried to establish themselves as hegemonial ‘cultural brokers’ for the Latin West. To a considerable degree, ‘learning empire’ meant learning from the popes. What cultural resources could the popes offer to the people of the Latin West? a) A general overview of ways in which the 8th-century popes built up resources for Christian rule and empire and acted as cultural brokers. Even well-known sources such as the Liber Pontificalis or the letter collections, chiefly the Codex Carolinus, will yield new insights, as a pilot study on a papal attempt to ban marriages with foreign wives shows. b) Along with positive models for identification with a Christian community governed by rulers faithful to the pope, the papal propaganda also transmitted and created positive or negative images of the Other – Lombards, Greeks, Saracens, pagans, heretics, and others. A study of the way these acts of Othering and Sameing were used can rely on material already collected in Vienna, and directly links this project to the project in Leeds. c) The transfer of knowledge and of cultural models to the North worked, not least, through the distribution of manuscripts; but only very few can actually be traced to the city of Rome. An exemplary study on the distribution of manuscripts of the LP will deal with a text that clearly originates from Rome, circulated in interestingly different versions and was very popular in the Carolingian empire. A small study on one of the most intriguing manuscripts containing the LP written in the Frankish realm can be found here. As most other work in the CRP, this study will combine the technicalities of manuscript scholarship and textual criticism with a broad and theory-driven cultural-historical approach. Especially in German research, the troubled relationship between popes and emperors has always been a highly controversial and ideological subject; 751/54 and 800 were seen as constituting the beginnings of the history of the German ‘Reich’. This has led to lasting distortions in this field of research that are only gradually being overcome. This project attempts to see the subject from a different angle in at least two respects. Firstly, it will focus on the cultural dynamics of the exchange between the different actors in the political and ecclesiastical field, and therefore concentrate on the resources of identification and legitimisation rather than on the vexed questions of political goals and strategies. Secondly, it will attempt to transcend the facile pairs of oppositions that have always dominated the field: Church/state, pope/emperor, East/West, lay/ecclesiastic etc. They all were partners in the rich ‘cultural flows’ of the period; and although they competed for the available resources of knowledge and power, they all took part in the effort to construct a viable model of Christian community and rulership, which they then strove to control and manipulate. Seen from this angle, a ‘close reading’ of the sources can still yield surprising new insights. The proposed manuscript study supplements this effort. Studying the copying and transmission of manuscripts offers invaluable material on cultural memory, especially in the variants, textual changes and changing contexts of the single texts. This approach has been developed recently in Vienna and its partner institutions. The Cultural Memory Project provides an excellent opportunity to push it further in close collaboration. Detail, Triclinium Mosaic, Lateran, Rome: Pope Leo III. and Charlemagne are kneeling in front of St. Peter, who gives a pallium to the pope and a vexillum to the Frankish king.